Lots of traders like to buy breakouts as, across those resistance lines, shorts are flushed out and overhead price resistance dwindles. We're not of that mindset when considering buying gold and prefer to buy along technical support. 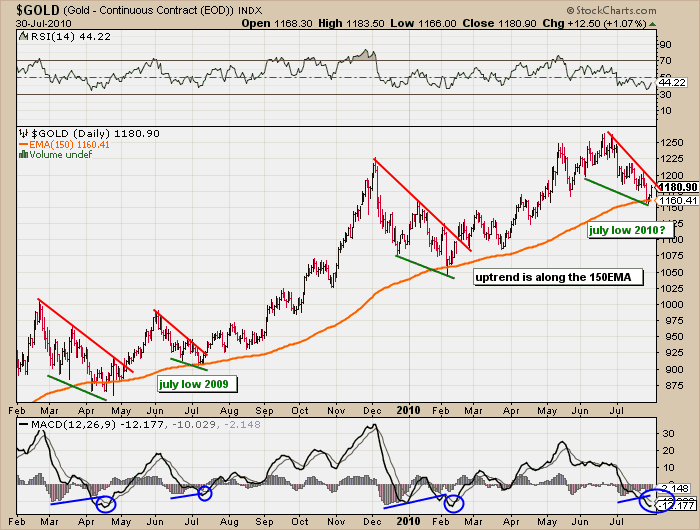 Gold has been following its 150-day exponential moving average so, until such a time that it changes its behavior, we have no choice but to buy support. So, we did with gold under $1160 last week. Mind you, the buy signal has yet to occur. One of our favorite trading vehicles for gold is a paper instrument leveraged double to gold's price movement, DGP. We were buyers at $29.10 with a stop underneath the rising green support line. Quite a while ago, we penned an essay for Gold-Eagle.com of a breakout pattern we had discovered in the gold market and promptly it failed to work! That can happen when good secrets are given away. Well, from time to time it turns out that the signal works rather well. 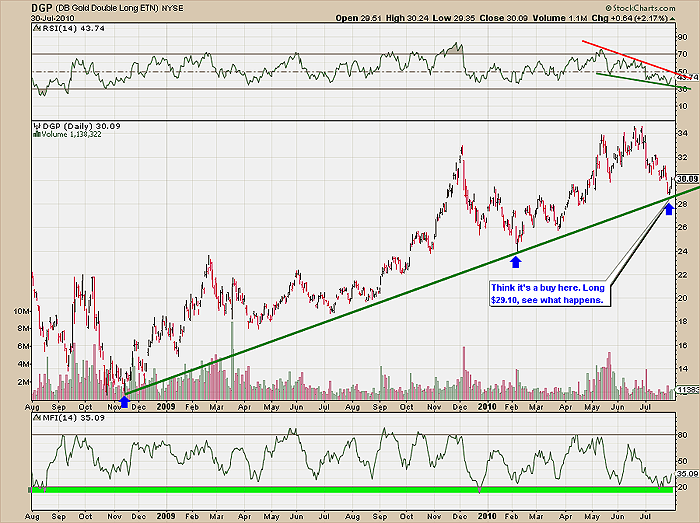 As you can see in the chart above it worked quite well during July 2009 and February 2010. We think it's about to work out one more time. This buy signal requires a nearly simultaneous breakout of RSI, Price and MACD. The alignment is right on schedule complete with positive MACD histogram divergence. But the gold market carries risk like any other. The bears are insisting that gold has topped. Well, perhaps it has for a while. In the chart above you can see that the financial meltdown took gold all the way back into its 200 week exponential moving average. Could that happen again? Sure it could. For now, we're more concerned with immediate support along the 150-day EMA so that's what we'll put our stop under. A trader can't be trading off fear or even greed. A trader trades off technicals and pays attention to repeated patterns. 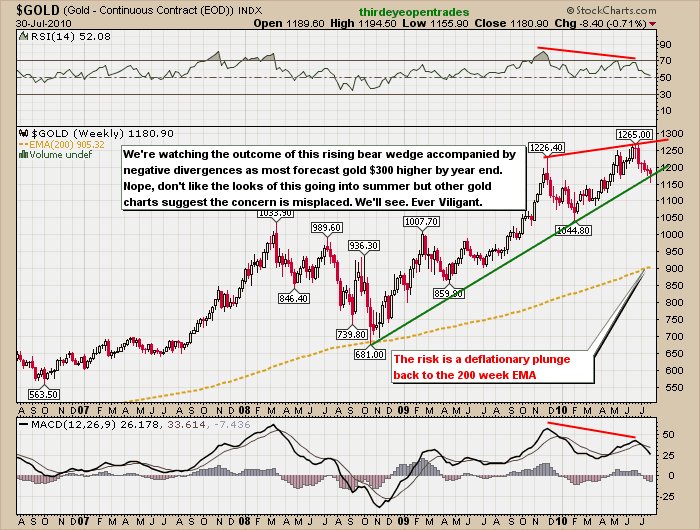 If the rising wedge turns into a bearish pullback for gold we'll know right away as gold would fall away under its 150-day EMA. Current support levels we're watching at Thirdeyeopentrades include $1140 and $1090. We doubt you'll see gold underneath $1044 again this year. But, we shall see. Gold has a mind of its own. Thirdeyeopentrades subscribers have other tools which help identify where to buy gold and how we'll know when gold's multi-year Bull Run is over. Our newsletter is distributed on a weekly basis and the price we charge is way too cheap and purposely so that even a youngster with a paper route can learn about the gold bull market and be able to purchase our research. We give out the most recent newsletter at no charge to anyone who has yet to view one. 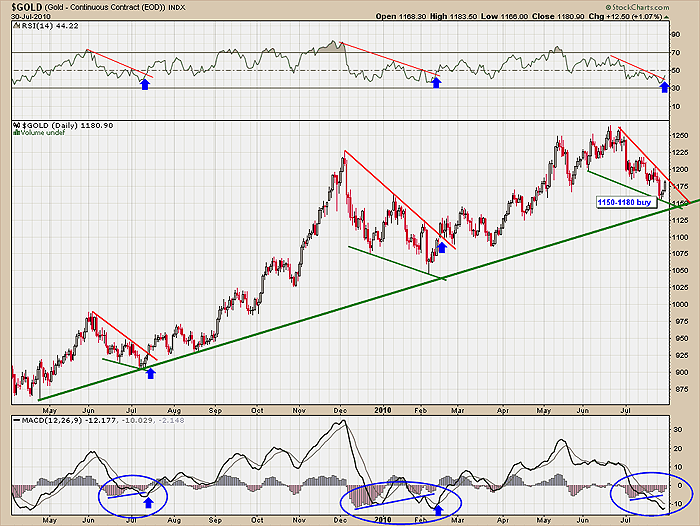 Gold isn't the only sector we're watching…. We don't want to give away all our secrets as some are reserved for paid subscribers. 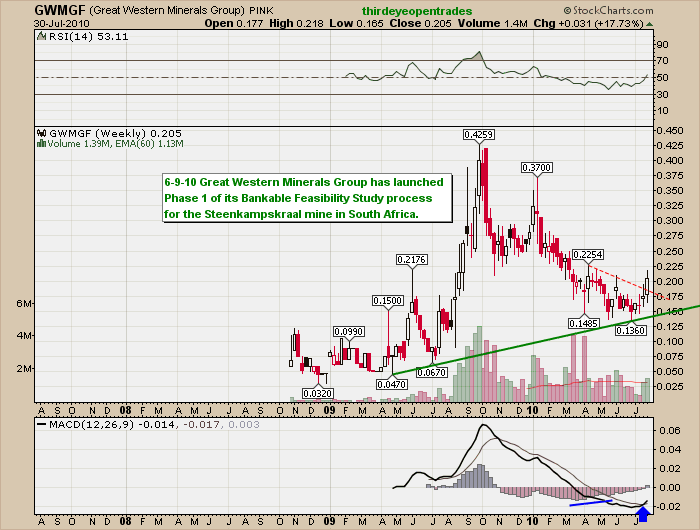 Thirdeyeopentrades actively trades the Rare Earth Sector which has garnered considerable attention the past month. Why not give a newsletter subscription a try?